How To Buy Mosquito Magic. It's Easy To Do. How To Buy Mosquito Magic® In 3 Easy Steps. Spargo Enterprises has strived to make your Mosquito Magic® buying experience as simple and pain free as possible for everyone. Scroll down the home page to the Mosquito Magic® product you want to purchase and click on the large red "Add To Cart "button. When you do that the product will be added to our shopping cart. In the shopping cart window that opens in your browser window, choose which payment option you want to use. Chose "Check Out" to pay with a credit card, or "Check out with Paypal" to pay using your Paypal account. You do not need a Paypal account to purchase Mosquito Magic® with on our site. If you chose to pay with a credit card, in the cart window that appears after clicking "Check Out", click on the "Pay with a debit or credit card, or Bill Me Later" link circled in the image below. If you selected "Pay with a debit or credit card, or Bill Me Later" to pay with a credit card, fill in your name, address, credit card information, and click the gold "Pay" button to complete your purchase. 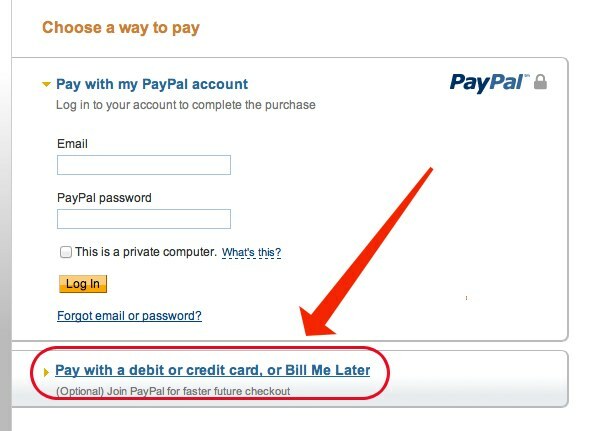 If you selected "Check out with Paypal", log into your Paypal account and follow the directions to complete your payment using your Paypal account. Your Mosquito Magic® order will ship out to you within 24 hours of receipt of your order. Please note: If you used a Paypal echeck payment to purchase your order with, your order will not ship until your payment clears. This usually takes 3 to 5 working days. All other orders are shipped within 24 hours of order receipt. If you have any questions about your order, please use the form on the Contact Us page to send us a message or click on the "Email Us" link in the yellow footer area at the bottom of the page.